On Tuesday July 31 NEC opened their new Briefing Center in Downers Grove, Illinois just outside of Chicago. The new space incorporates three floors, two of which are connected via an open-air staircase in the center, and over 6,000 square feet. 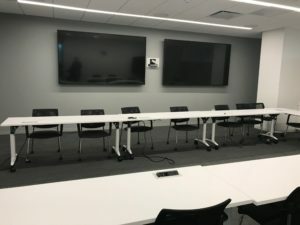 The new space allows NEC to provide audiovisual industry dealers and their clients to see in what areas the manufacturer can solve various challenges using their technology. The main entrance showcases ten different spaces that have been created to simulate a real-world situation. The briefing center has a healthcare section the demonstrates a mobile healthcare cart, a command and control center, as well as large venue projection. The entrance area also features one of NEC’s direct view LED walls. The content showcases the color and pitch that the manufacturer is able to create. The space also dedicates a portion to NEC’s retail applications. This service allows NEC’s facial recognition to trigger content for digital signage based on gender and age. According to Rich Ventura, Vice President of Strategic Management for NEC, “The software does not record the information. 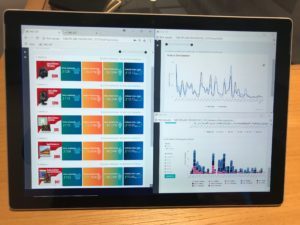 The video is analyzed for key points and trigger the content based on the video passing through.” More information about this new digital signage backend will be released at NEC’s annual showcase in New York at the end of October. The briefing center doubles as the new offices for NEC’s U.S. force. The offices, conference rooms, and training facilities have been designed for an open and communicative working environment. Each desk and work area has a height adjustable desk so employees can choose to stand or sit at any given time. The workspaces are not sectioned off by high-walled cubicles but have a more open feel. Conference rooms with and without technology pepper the area so a team can work on a project or design together and collaborate with screens. If they choose to discuss or don’t need a collaboration space those are available as well. The training room for the new space is a “vast improvement”, says Ventura. “We are able to arrange the training space depending on what we need and have the capability to display specs on one screen and instructions on another while collaborating on a third.” The training center has modular tables and three displays, one of which is a mobile NEC collaboration display. The new NEC briefing center will allow the company to bring in consultants, audiovisual engineers and dealers, techs, as well as potential clients. The trend of these new experience centers is growing in the audiovisual industry. Shure opened up a similar one in downtown Chicago in April. The idea is to give dealers, specifiers, and potential clients an idea of what the technology and implementation should look like in the real world. 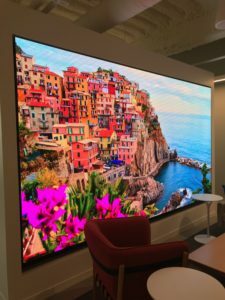 It’s an idea that allows dealers to focus on their energies on building relationships and design teams and not on a showrooms, which has never really caught on in the commercial AV space. Even some residential AV dealers are scaling back or eliminating their showrooms.